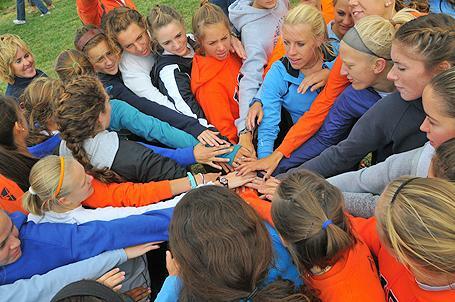 The 2010 Flying Dutch finished second in the Michigan Intercollegiate Athletic Association (MIAA), were second in the 34-team Great Lakes Regional and competing at nationals for the first time since 1998 ending 19th in the elite 32-team field. Coach Mark Northuis begins his 23rd season at the helm of the Hope cross country program. Under his leadership the Flying Dutch have finished third or higher every season in the MIAA standings and has been a top ten finisher at regionals seven times over the past decade. Six of the seven runners who competed at nationals return to this year's squad which numbers 22 returning letterwinners. Those runners are sophomore Camille Borst of Allendale (Allendale HS), junior Sharon Hecker of Grandville (Grandville HS), senior Kelly Lufkin of Houghton (Houghton HS), senior Kate Nelson of Williamston (Williamston HS), junior Taylor Mattarella of Traverse City (Traverse City Central HS), and senior Karlyn Sikma of Grand Rapids (North Pointe Christian HS). Co-captains of the team will be Kelly Lufkin and Karlyn Sikma. Other returning senior letterwinners include Alyssa Ambrose of Okemos (Okemos HS), Salome Emmanuel of Wheaton, Ill. (Wheaton North HS), Katrina Gobrogge of Napoleon, Ohio (Archbold HS), and Gina O'Brien of Saline (Saline HS). At last year's MIAA championships, Hope was edged by rival Calvin by just two points. Six Hope runners finished in the top ten led by Sharon Hecker in fourth place. Five returning runners achieved All-MIAA recognition -- Camilie Borst, Sharon Hecker, Taylor Mattarella, Kate Nelson and Karlyn Sikma. Hecker was also honored as the team's most improved runner while Borst was named the rookie of the year. Last spring Katrina Gobrogge and Kate Nelson were named to the All-MIAA track & field team. The Flying Dutch also continued to excel in the classroom as they were named to the Academic Honor Roll of the United States Track & Field and Cross Country Coaches Association for the 21st consecutive year. No other women's Division III program has achieved that distinction.